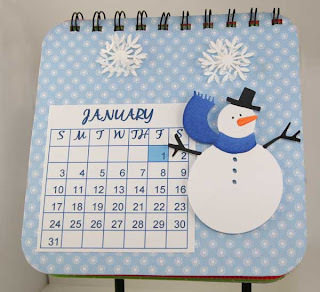 I am going to show you 3 months of the calendar I made for 20 friends and family. I will post more of the months as soon as I can. My niece and her family are arriving tonight from Wisconsin, so I have lots to do before they arrive. I wanted to give you a quick preview of what I made and why I haven't posted any cards for several weeks. I truly thought I could do this project in a 3 day weekend, but it took more like 3 weeks. I had such a good time and enjoyed it so much. Jon did all the wires with my new Zutter machine for me or I would have never gotten done. He enjoyed that too! The display stand is something I will be carrying in my store. 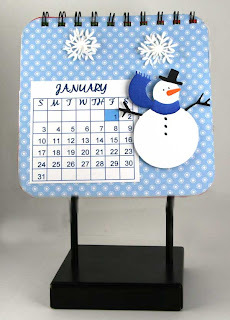 It is very nice and heavy and perfect for a calendar, cookbook, photo album or similar items. I printed the calender in Excel. I first tried to stamp them and then realized how long that was going to take, so I went to the computer for help and I liked how it turned out. Snowman cut with the Cricut and colored with my Copic markers. Snow Flakes punched with Martha Stewart Snowflake punch. Lion Ribbon was used for the bow. SU Paper. These look fabulous, Joan! I was going to do something like this before Christmas too, but never got the time! 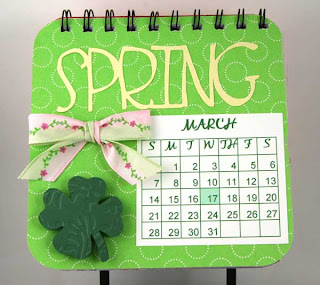 :( My Mom kept telling me how much she wanted a new calendar since the last one I made for her was at least 3 years ago! LOL Think maybe it's outdated??? Have a wonderful time with your family! Give me a shout when you have time, so we can catch up! Joan, These are absolutely gorgeous! Can't wait to see the rest of them! Thanks for sharing them with us! I love these Joan!!! Hope you show us more! I am also interested in the stands when you get them in your store. What a wonderful project, Joan, and absolutely perfect gift for so many of your family and friends! Hats off to you for getting so many done!!!! Way to go!!! Fabulous job. Can't wait to see the rest of the year. Looks FANTASTIC Joan!! How clever of you ... I'm sure they were all thrilled to receive them! Looking forward to seeing other months!! Wow Joan! Your calendar is great! Love it and can't wait to try one myself. Looking forward to seeing the rest of your wonderful calendar creations. That is a great idea and what a fabulous job. I love it!!!!! I love your calendar, Joan. Makes me want to get busy and make some for friends next year. Think I'll get them done? Thanks for sharing. Gulp! Did you say 20. Last year I made 12 of the kind that fits into a cd jewel case and like you, printed the calendars. Still, I was too through with them once finished and this year, I just didn't feel like doing a repeat. Maybe next year. I have had my Zutter for 2 yrs. (had to have it, didn't I) and haven't used it once...GROAN. Totally adorable Joan, what a wonderful gift idea! 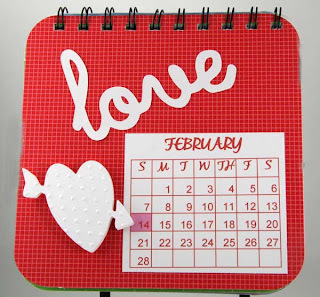 The recipients will think of you all year long as they view their calendars throughout the year. Joan that you so much for sharing this with us. I am ready to start mine now so I can finish for NEXT Christmas. Any thoughts as to how to "bind" without the bind it all?